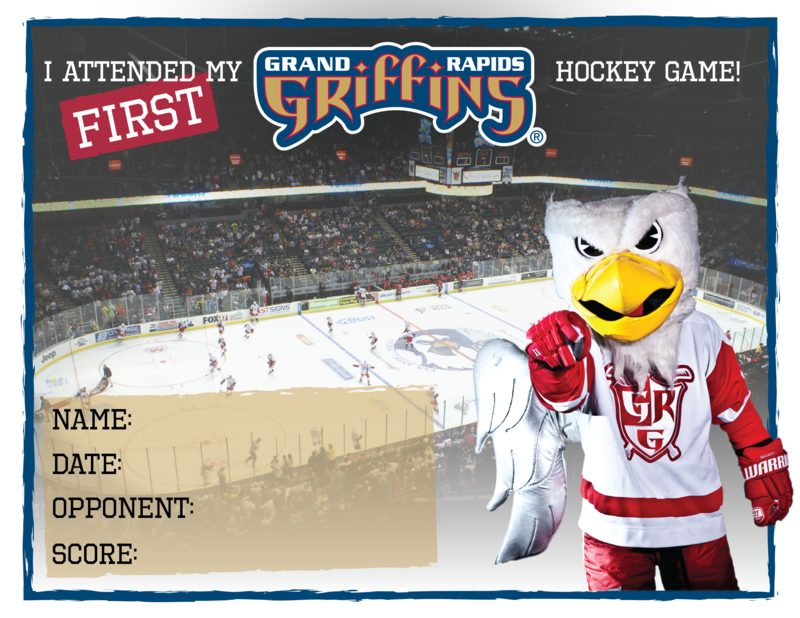 The Grand Rapids Griffins would like to congratulate you on your outstanding achievement! As a reward, you receive two (2) complimentary Upper Level Faceoff tickets for each bookmark. To redeem your free tickets online, click the REDEEM button next to the game of your choice below. - Select the quantity of complimentary tickets by using the READING GOALS price code. Maximum of 3 vouchers (6 tickets) are to be redeemed per family per game. All tickets are best available. If you'd like to pick your seats, you must redeem your vouchers in person at The Zone or at the box office. No phone orders are accepted. Children over 2 years of age require a ticket. - Additional tickets can be purchased for $16 each by selecting the quantity of tickets you need by using the ADULT ADV price code. - All online orders must be placed under a parent/guardian's name as a photo ID is required when picking up your tickets. All tickets will be available at WILL CALL only on the day of the game only when the box office opens 90 minutes prior to game time. (2) the filled out Griff's Reading Goals bookmark(s). Tickets WILL NOT be released to you if all items listed above are not present. If you forget your vouchers, you will be given the option to purchase those tickets at full price. All tickets at will call will be released 30 minutes after the start of the game. If you show up after that time, you will have to pick new seats at the box office or The Zone. YES! Upgrades are available for a nominal fee which varies by price level ($3-$15 per ticket). You may do so by selecting the UPGRADE option next to the game of your choice. You may purchase additional seats that you do not have a voucher for as well. Vouchers must still be turned in at will call when you pick up your tickets. If you forget your vouchers you will be charged full price. No refunds or exchanges.